“Aloha” is one word that carries a weight of meaning, including: love, peace, compassion, mercy, and affection. Walking into 'āina, every patron is greeted with this warm embrace in the intimate, yet causal, dining space. At 'āina, Head Chef Jordan Keao delivers the flavors of the Big Island, where he was born and raised, across 2300 miles of ocean to the Dogpatch neighborhood in San Francisco. Here he serves Hawaiian food, which is the amalgamation of foods native to the tropical island, as well as foods introduced by seafaring nations, such as China, Korea, Japan, the Philippines, Puerto Rico, and Portugal. Using fine dining techniques and seasonal ingredients, Jordan puts the spirit of aloha into every bite of his rendition of Hawaiian comfort food. While Hawaii is known for its stunning beaches and surfing pipelines, it is also very famous for its obsession with Spam. This canned product was originally brought to the island during WWII to supply a shelf-stable product for the troops stationed there. Locals have since adopted this gelatinized, mystery pork product into the fabric of their diet. In fact, even though only 1.42 million people live in Hawaii, 7 million cans of Spam are eaten there every year. That is some serious devotion to devouring Spam. Hawaiians have concocted hundreds of kitchen creations using spam as the star ingredient. 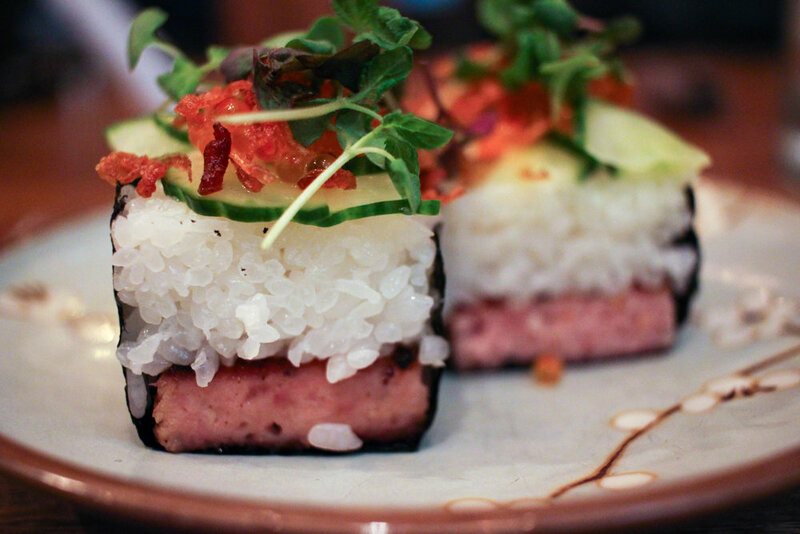 Perhaps the most popular way to eat spam, however, is spam musubi – or spam sushi – undeniably influenced by the large Japanese population on the island. Knowing, and somehow not “truly knowing” what goes into a can of Spam, my instinct was to veer away from the spam appetizer. However, after talking to our waiter, I realized that if I ever wanted to try spam musubi, this would be the time and place to do it. Committed to using ingredients from sustainable and organic farmers, 'āina uses Stone Valley Farm pork to make their “spam”. Chef Keao presents the fried spam on a rectangular bed of rice, snuggled in nori (seaweed), and topped with Tsar Nicolai smoked trout roe. I erased my assumptions of what this dish would taste like, took a bite, and then found my plate empty within a matter of moments. 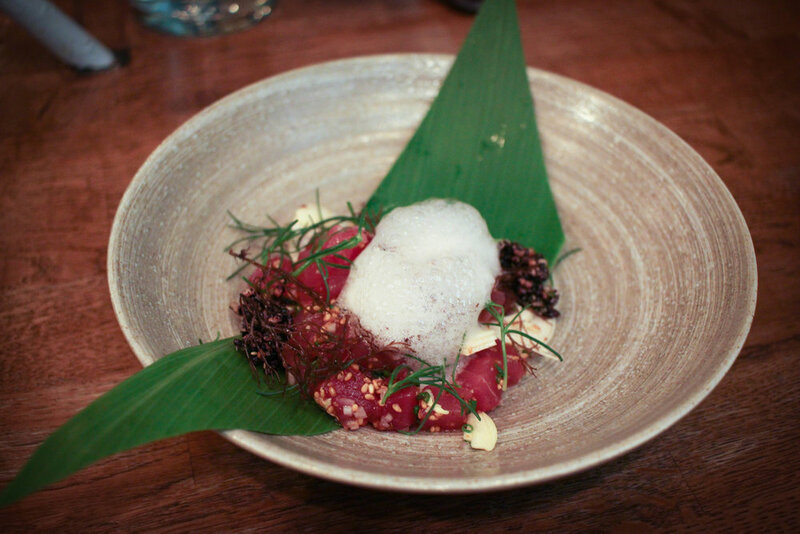 Poke, a popular menu item at 'āina, is another food indicative of modern Hawaiian cuisine. Fishermen launched this food trend, as they used to eat the cut-off of larger pieces of fish that went to market. With time, they started using Japanese seasonings such as soy sauce, sesame oil, and green onions to dress up their raw fish. This salivating concoction caught on in Hawaii, and now this leftover fisherman’s food is something Hawaiians eat on a regular basis. At 'āina, they have their own spin on the poke, and they add limu, inamona, smoked sesame oil, hawaiian hearts of palm, and sea grass. For the last dish we shared saimin, a Hawaiian noodle soup dish. Considered the state dish of Hawaii, simin is even sold at McDonald’s! A cross between Japanese ramen and Filipino pancit, the soft nori noodles bathed in a hot and salty dashi sauce. Chef Keao also added lap cheong, shoyu tea egg, kauai shrimp, and shaved cured egg yolk to make this dish pop with a myriad of flavor sand texture. This dish perfectly represents the fusion of cultures in Hawaii and how Hawaiians continue to forage new culinary traditions.